As woodworkers, we often wonder how specific wood will react when worked. How does it compare with others when it is cut, shaped, turned, finished? Does it have special characteristics making it more suitable for some uses than others? A complex subject. Yet one way to learn how different materials behave is to build the same design in more than one wood and to give them all the same finish. to a smooth finish and is relatively easy to turn. While hard maple [Acer saccharum, i.e. 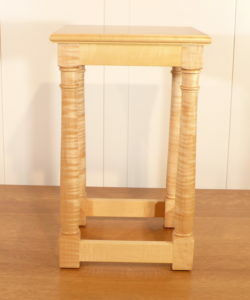 "sugar maple"] is preferred for non-upholstered furniture, this particular piece is made of a soft maple—perhaps Acer pseudoplatanus, or "sycamore maple." With age, exposure to light will cause the wood to darken, but with an uncolored oil finish, the beautiful grain patterns should be preserved. Bubinga [such a musical name!] is native to equatorial Africa. 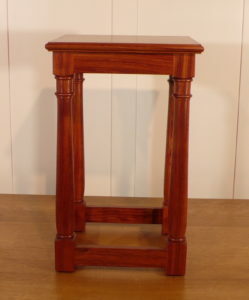 Often cited as a replacement for rosewood, it is denser than even hard maple and very strong. Naturally oily and with a moderate luster when unfinished, it turns relatively easily and seldom splinters. Many boards are highly figured; the ones used here resemble ribbon-stripe mahogany. 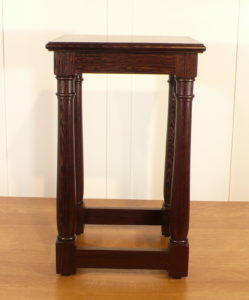 An oil finish helps to bring out the figure and increase the luster. 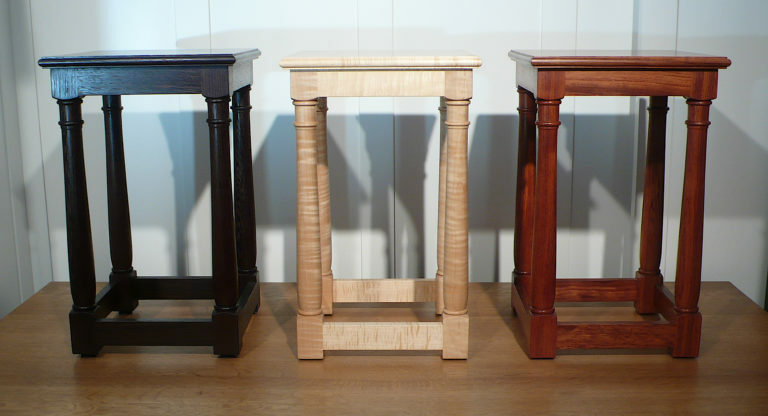 challenging to turn without splintering and difficult to sand evenly. It is also somewhat toxic: those splinters can be painful! Despite all this, it is worth the effort. Naturally a study in medium browns, it will darken to almost black if given, as here, an oil finish. This makes it a good substitute for ebony in applications where a very dark wood is desired.